Trusting another person isn’t easy, especially if that person has let us down. 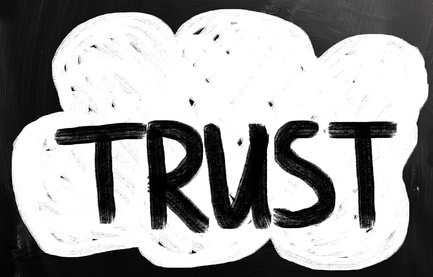 But trusting is an essential part of loving, and, with God’s help and example, we CAN decide to do it. One summer morning, Scott received a phone call from the local high school. It was someone in the school office with the message his daughter, Carol, had cut summer school classes that day. Scott’s heart sank. This wasn’t the first time Carol had been in trouble at school, and recently, things seemed to be spiraling out of control. Carol’s classes were at a school across town. There was nothing Scott could do until it was time to meet her bus in front of her own high school. He waited, wondering if she’d even be on the bus. She was. She walked to the car and hopped in and said, “Hi, dad” as if nothing was wrong. When Scott confronted her with cutting class, she denied it. She insisted that she’d gone to every class and hadn’t skipped anything. Based on her recent behavior, and the report from the school, Scott was skeptical. He pushed for the truth—where had she been and who was she with? But Carol continued to insist she had done no wrong. Oh, except that she was two minutes late getting back to one class because she’d met a friend in the hall. Scott wasn’t sure how to handle the situation. Carol might be lying. He was pretty sure the school wasn’t. But then he remembered 1 Corinthians 13:7, “Love … believes all things.” He decided to trust Carol. It wasn’t easy to suppress his lingering doubts, but he told her he accepted her side of the story. The next morning he called the teacher of the class Carol had supposedly missed to find out what had happened. The teacher explained how, in summer school, a tardy is marked down as half an absence—two days of late arrival count as a missed day of class. This was Carol’s first offense, but somehow the school office had gotten things messed up and made the call to Scott. Scott was happy that he’d trusted Carol (although he did let her know the consequences of a second late arrival at class). It helped to restore a foundation of trust between him and his daughter which had been eroding in recent months. This occurrence didn’t involve any grandparents, but it does point out an important truth. Our love for our kids and grandkids should mirror God’s love for us. We fail, and there are consequences, but those failures never influence the way God loves us. He treats us with a grace we don’t deserve, whether our walk with Him has been consistent, or we’ve failed Him miserably and repeatedly. Every morning, every moment, He offers His love, comfort, peace, grace and joy. He “believes all things,” which means that He believes we can allow the Holy Spirit to work in us at any and every moment. He forgets the past and encourages us regarding the future. That same principle should apply when we make the intentional decision to trust our kids and grandkids. Press forward. Aim toward the next goal. Don’t look back to past failures. Treat them with the same love and grace that Jesus Christ shows us every single day.